The twangy electric guitar strains on the soundtrack of the Korean period drama gives this new film by director Yoon Jong-bin a spaghetti western vibe. 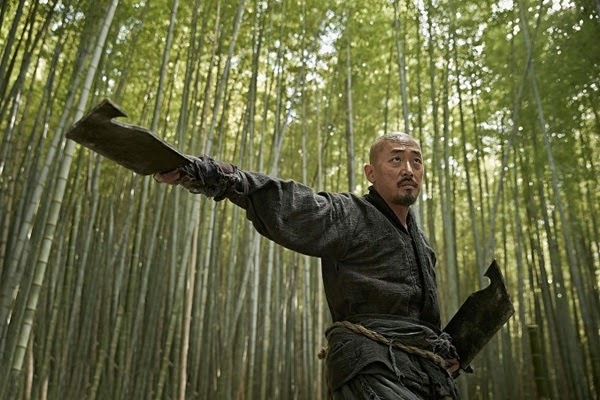 Kundo: Age of the Rampart in Korea breaking box office records (which was shortly toppled by The Admiral:Roaring Currents, another period action film). Written by Jeon Cheol-hong from a stry by Yoon Jong-bin, is set in the late Joseon dynasty. The bandit clans were called “kundo”. Beautifully photographed, and lushly costumed, there is a Robin Hood element where the poor steal from the corrupt nobility. And there's a little bit of the Magnificent Seven thrown in as the clan gets the poor to fight against the oppression. There are many stock type characters in this film that offer a humorous tone to the story, but it also highlights the corruption of the nobility and the hunger and poverty of the common people. Which is pretty much like real life. The Chusal clan of Mt. Jiri hide their village in the mountain valley They are an old clan filled with people who have been shunned from all walks of society. Their slogan is “united we are people, divided wear thieves”. The leaders of the clan look for three things when a new member wants to join their family. Their eyes must be clear, their will must be strong, and distinction is mandatory. Occasionally they will recruit someone like Dolmuchi (Ha Jung-woo), an 18 year old butcher who was offered money to kill a young woman. Except he didn't do it and tried to give the money back. Unfortunately they could afford to have Dolmuchi squeal on them so they burn his home with his family and leave him for dead. He manages to survive and his will to exact revenge is what leads the clan to ask him to join. Their main target is Jo Yoon (Kang Dong-won), the illegitimate son of a wealthy and corrupt lord who's wife only bore him daughter's. Jo Yoon is brought into the household to train to be the heir. But he's usurped by the birth of his half brother. Needless to say Jo Yoon grows up with a huge chip on his shoulder. He becomes an unbeatable martial artist and swordsman. The death of his brother brings him back home, but his position is threaten by his pregnant sister in law whose child may knock him off the waiting list. Jo Yoon is the ultimate bad guy, but you are made to understand why his is acting out. To try and get his father's approval he steals the land from the illiterate peasants by giving them bad loans, then turning them into slaves when they can't pay it back. The clan make plans to right the wrong. Dolmuchi who has been renamed Dolchi, with his head shaved and carrying two huge butcher knives has made a name for himself as by taking the top knots of the nobility, which apparently is a shameful loss. He's tough, endures physical pain, and loyal to his new family. The fight scenes, which is why most people will see this film are well executed and imaginative. 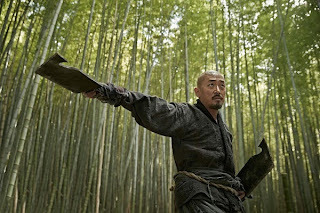 Dolchi and Jo Yoon have several showdowns with the best being in the bamboo forest. Catch the screenings at AMC Grapevine starting Friday, August 29.